So today, after a year-long self-imposed Star Wars media blackout, I went to see Star Wars: The Force Awakens. And it was absolutely perfect. I teared up at the beginning, I teared up at the end and throughout I experienced so many emotions that I was exhausted for hours afterwards. True story. I knew absolutely nothing going in, which was a phenomenal experience since I couldn't anticipate a single thing. And, in short, the movie was absolutely perfect. 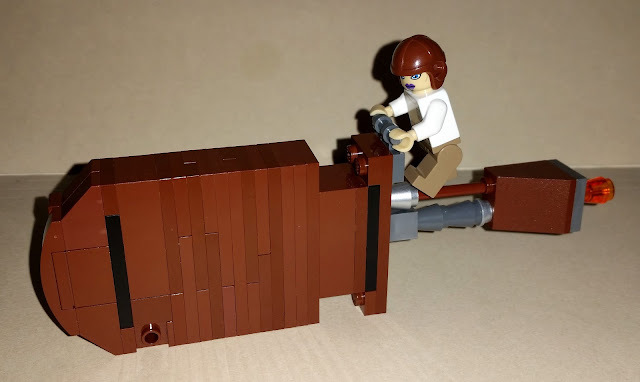 So, naturally, I had to build something from the movie for today's build. Don't worry, no spoilers! Rey is one of my favourite movie characters in a long time. She's brilliant, funny and fearless. And her speeder looks like a fudgesicle. So there's that :) This build was based off this one from Rebrick.